As the Network Creator, you have full control over the appearance of your Homepage. You can arrange the content sections in any order you’d like, choose how many items of each type of content appear, and set its privacy. 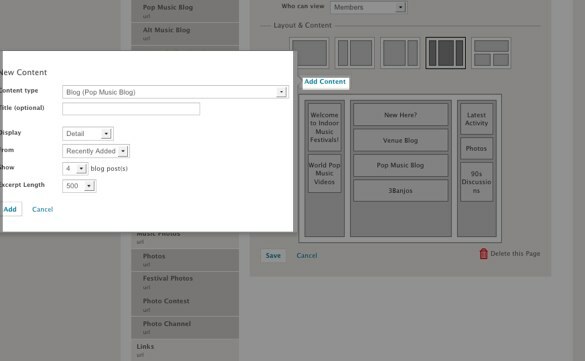 You can also easily change the layout for this page and add new sections to showcase your content. To set your Homepage, head to your Dashboard by clicking on the settings (‘hammer and wrench’) icon in the upper left hand corner of your network. Then, select the Sites & Pages tab to start customizing! First, you’ll want to create a new page by clicking on the “+ Add a Page” button. You’ll want to choose the “Custom” option for this Page type so you can start editing its layout and adding new sections. Then, select the radio button next to the ‘home’ icon to set this new page as your Homepage. You can also control who can view your network’s Homepage. For example, choosing a ‘member’s only’ privacy will make your network’s Homepage appear private to non-members and require visitors to sign up or sign in to view it. The next step is to choose a layout for your homepage. You can choose from a single column, two column or three column display in various widths. Once you decide on a layout, you can start adding content sections that you’d like to appear on your homepage. To start adding sections, click on the ‘Add Content’ button. When choosing a content type, you’ll have the capacity to choose from any existing content pages and features you’ve already added to your network’s main navigation. You can display specific Blog pages, Latest Activity, Photo Albums or even add a custom HTML page. The possibilities are endless, so get creative and show off all your best content to grab your member’s attention! Once you’ve decided on what content will make an appearance on your Homepage, you’ll want to configure how that content will display. To rearrange the layout of this page, grab the content section modules in the layout area and start dragging them around from column to column or in between the sections. Each content section module on the Homepage is a little different. For many, such as the Activity Feed, you can control how much content is previewed as an excerpt. If you want people to click through, Titles Only might be your choice. If you want people to get a sneak peak, choose ‘Detail’ and decide how many characters you’d like people to see. You may also be able to choose which types of content appear: Recently Added, Featured, Latest Activity or items from a specific content category. You can also adjust your Activity Feed Settings to control what gets displayed. These details are very easy to change, and we definitely recommend trying it all out! 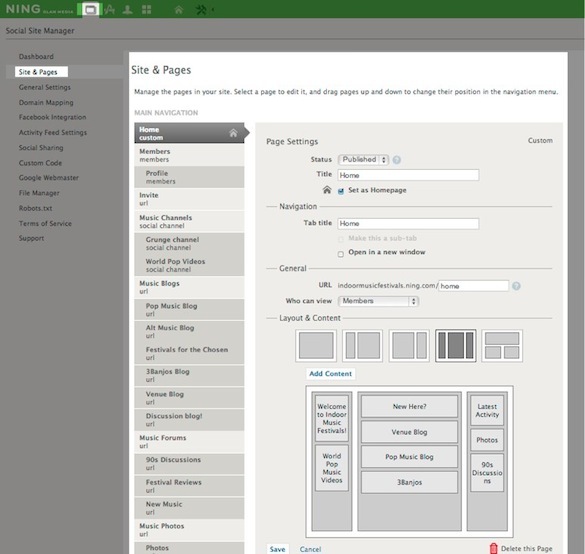 Start creating a social network with Ning website builder.